the nature and profile of Italian recruits. the communist tendencies within patriot resistance groups. the role and contribution of subversion and sabotage in the Italian campaign. the vital role of SOE wireless links in communications leading up to the signing of the armistice with Italy and in contacts with officials in Rome after its evacuation by the Germans. the exploits of 11 coup de main parties working in support of General Alexander's offensive. 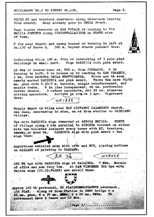 SOE liaison with Italian patriot resistance groups, including guerilla bands in the Appennines and in the Ligurian Alps. the strength and successes of groups in Piedmont, Lombardy and Liguria which forced the Germans to divert substantial forces to these areas. interrogations and enemy double agents. Major Malcolm Munthe which carried out 70 missions behind enemy lines in four months from September 1943.
the SOE detachment in Florence involved in heavy fighting in August 1944.